What a beautiful holiday! Our festivities began Christmas Eve, as we visited much of our family in Orange County. After leaving out our cookies for Santa and sprinkling the front lawn with reindeer food (oats and glitter), we piled into our car with gifts and blankets and George Winston's December album. Listening to this album on the way to Christmas Eve dinner is a tradition that began when I was little, and now I get to share that with Katie. When we arrived at Nana's, the scent of warm apple cider greeted us cheerfully. Although we wished we had more time with Nana, we got to give her our gifts and visit for a little while. Nana gave Katie a special recording of The Night Before Christmas, with Nana's voice reading the story. This will be a treasure for all time. After a visit that was too short, we made our way to Newport Beach for dinner with the Yoder part of the family at The Ritz. It is amazing to be able to share with my daughter the Christmas Eve experiences of my youth. I love that she is able to have memories of Christmas Eve in her great-grandfather's house, that we have that in common with each other. The Ritz dinner was tastier again this year. We began with shrimp, crab, and lobster cocktail, which never fails to be absolutely delicious. The next course was a soup or salad, so I ordered the mushroom soup with morels (YUM!!!!) and was able to eat part of Bill's salad, too---a pear and goat cheese composition that I loved. For the main course I ordered the osso bucco this year. I always order the roasted goose with red cabbage and apples, but it was sounding a bit rich that night (I had little waves of pregnancy queasiness, but they passed without incident). I did miss my goose this year, and I found the osso bucco to be melt-away tender but also under-seasoned for me. Still, with the gratineed cream corn, the main course was nothing to complain about. Dessert was back to fine form this year (the pastry from The Ritz can be hit and miss): a delicate pear tart, lemon meringue pie, and chocolate cake comprised a dessert sampler in small sizes. Back at Great-Grandpa's house, the children played a bit and Katie admired the tree. We went outside to look at the various lights reflecting in the bay and with the nip of cold in the air, Christmas Eve was quite cozy. Katie and I sat together in the back seat on the way home, and we spent the whole drive seeing if we could find Santa in the sky and talking about where he might be. We got home near 11:00 pm and by the time I got Katie bathed and settled, we were almost at midnight. After she fell asleep, Santa came. I was new to the rite of passage known as "Christmas Eve toy assembly" this year, as I had decided to build Katie's train set for extra effect. That took about an hour, and so I ended up with only a little sleep. On Christmas morning, Katie and I ran to the staircase and looked over the banister. When she saw all the presents, she exclaimed, "Oh my gosh! Oh my gosh!" The first task of the morning, though, was to check the cookie plate: Santa had left some crumbs and the leg of a gingerbread man and had evidently poured himself a mug of milk and left a napkin behind. Katie loved exploring her stocking and was very enthused about a set of Hello Kitty chapsticks. After the stocking, she ran speedily into the living room and loved opening her presents. Following presents we got dressed for Christmas breakfast at my mom and dad's house. David and Ashley had breakfast with us and we opened presents. My mom makes a yummy Christmas breakfast: a woven yeast bread studded with green and red candied cherries, eggs with cheese and ham, sausage, and stove-melted hot chocolate. Delicious. We visited with David and Ashley for a bit before they left for her family's celebration, and then Boppa and I took the gifts back to my house. Boppa assembled Katie's easel while I put away all the gifts and cleaned up from our opening of Santa's presents. I was so glad to have this time and not have to come home to chaos later in the evening. I am also thrilled that Katie's easel is assembled, because now we can use it right away today. I gathered the food I had prepared to contribute to our Christmas dinner and then went back to my parents' house. (I love living so close!) 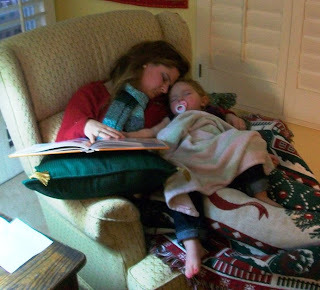 Katie and I read some books and we both got to take a nap together, cozy by the fire as the smell of prime rib filled the house. Our Christmas dinner was very tasty: prime rib and gravy, mashed potatoes, green beans, glazed carrots, creamed corn, popovers, butternut squash soup and cranberry pecan salad to start, apple cider, and creme brulee with raspberries. Very old-fashioned and English. Yum! Katie had her bath in Amie's tub, which she always loves, and we came home in jammies and read and fell asleep. A very cozy Christmas! I hope everyone found the magic in the day! Katie loved this, a new tradition. She keeps mentioning it, so I know it made an impression on her. For Katie, the carollers were the best part of dinner! They sang several songs she knew, and she had a front row view! Talking with Amie about the singers. Katie gives Amie a running-start hug! Boppa assembled a new bench for my entryway! And Amie made the cushion! I love it! It looks so cozy by the front door. On top are the silhouette of Katie I made for Amie and Boppa, and the scherenschnitte (delicate German paper cutting) I made for Amie of Noah's Ark.